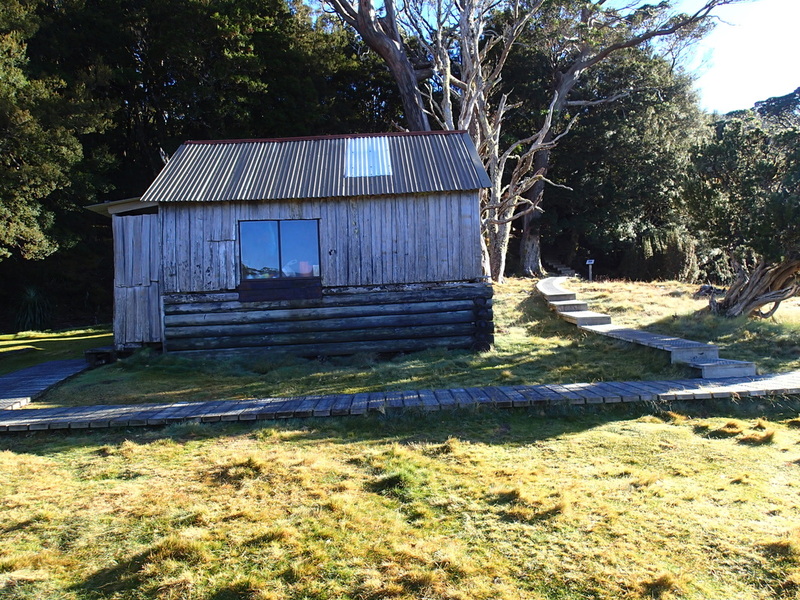 The Overland Track begins at Ronny Creek Car Park in Cradle Valley. This is where you begin your epic trek, and where you will have your heaviest pack to carry for the entire trip (and also have the highest ascent of the Track too, just to make that pack seem even heavier!). This part of the trip has 2 side trips you can make as well - Barn Bluff (400m climb) and Cradle Mountain (320m climb). 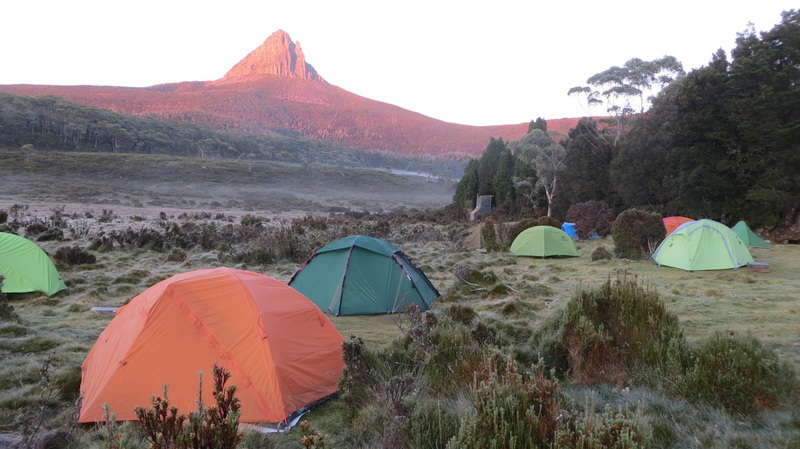 In fact, some people do the Cradle Mountain climb as a day trip, and not do the Track - but as day visitors. Your destination is Waterfall Valley, 10.4km away. There is no camping allowed before you reach there. So once you start the walk, you have to keep going to that point! 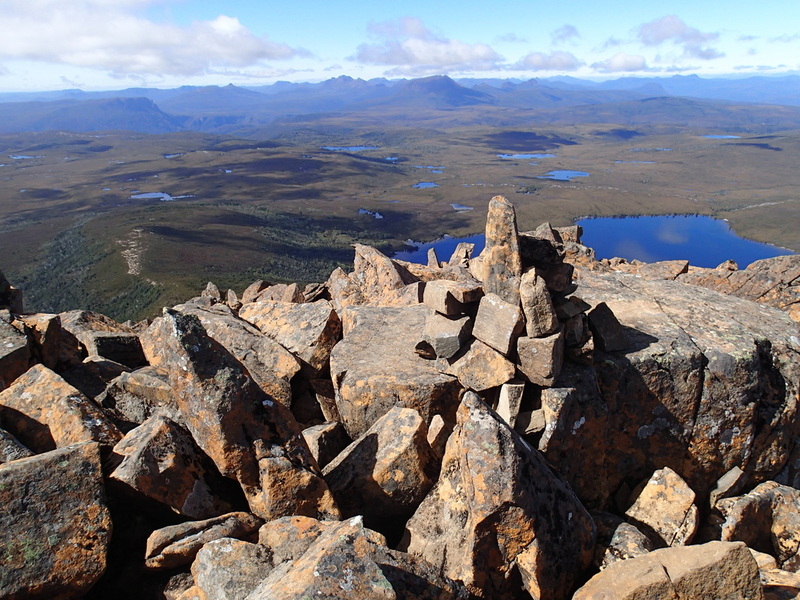 You will pass the very well known, Dove Lake and then begin the climb up the rocky path to Marions Lookout - excellent vantage point to see Cradle Mountain, with Dove Lake at its bottom. As you walk down into Waterfall Gully, it is a welcome sight. The first day is tiring with a steep climb, and most consider it the hardest. Especially if you have incorporate one or both side trips. 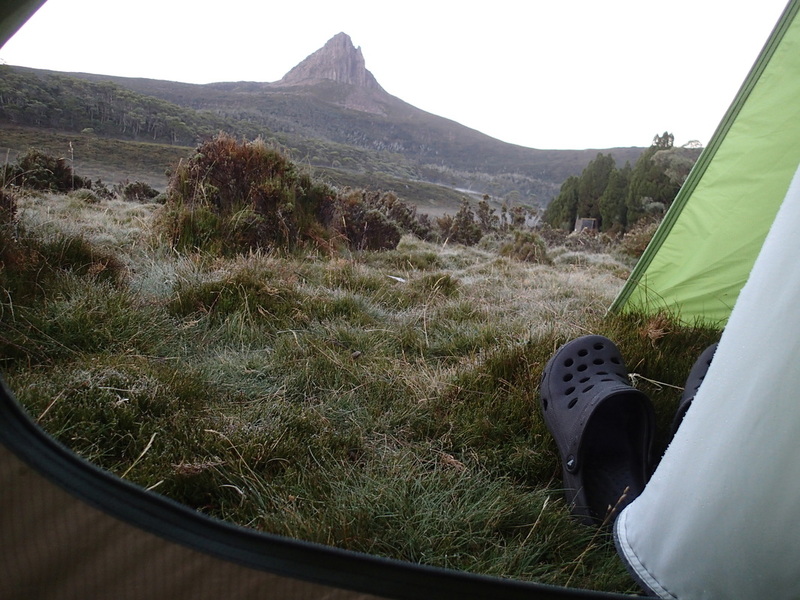 Camp is on the open plains, with good views of Barn Bluff and Scrubby Eucalypt Forest. As we had a late start, I had not done the side trips at this point, and would do Barn Bluff on Day 2 of the hike, before setting off for the next camp. There are 2 huts available. 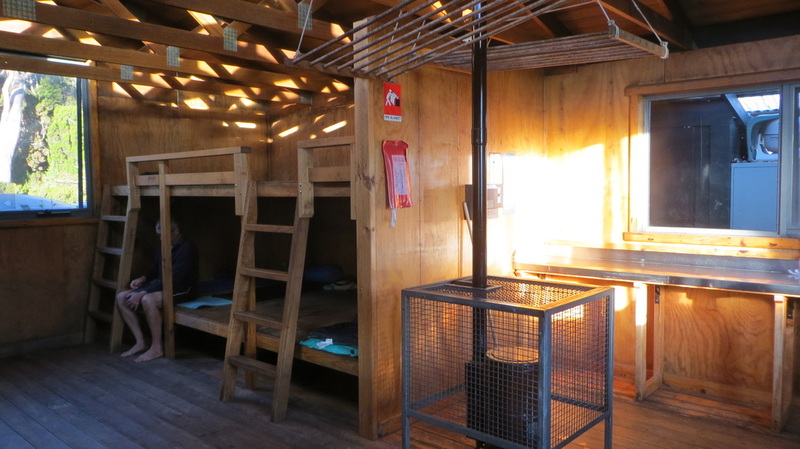 The first holds 24 people and is the more modern of the huts. Like all of them - it just contains the basics. Bunks and area to eat. No electricity, no inside toilets, no cooking facilities. The smaller of the huts holds 8 people. 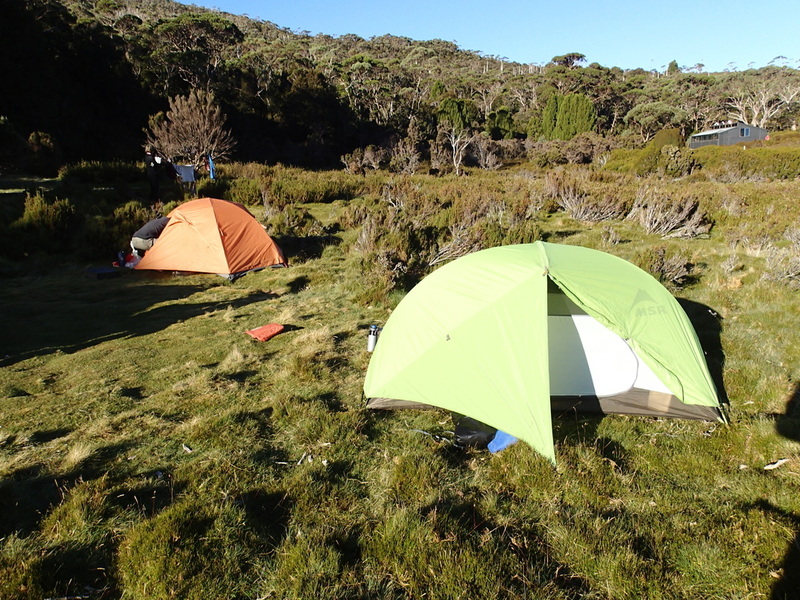 The small hut (above) was also used by tent campers to put their packs in overnight, as possums often rip into tents to get to food. Keep that in mind for the entire walk!!! Wildlife and rodents will forage through your belongings. To the left, this is indicative of what its like in the huts. Some walkers rushed through the walk to ensure they got a spot inside the hut - I chose to enjoy the scenery, as I intended to use my tent except in bad weather. By 4:30pm that day, all huts were full. There is a water tank where you can get rain water - many people don't sterilise the water from these tanks as due to large amount of rainfall, and use, they get flushed out regularly. It is up to you! There are toilets available - composting and smelly but largely clean. At the time of visiting, tent platforms were under construction, so I could camp anywhere on flat ground in this area. Many people choose to do this so they can enjoy the scenery and peace. Side trip to Barn Bluff (Tasmania's 4th highest mountain) is worth the effort. From Waterfall Valley you can see the Bluff from your campsite, and looks very impressive (see photo above). Another side trip is to Lake Will. To the right is a view of Barn Bluff - from Waterfall Valley campsite. To get there form Waterfall Valley, you need to backtrack a couple of kilometres to reach the turnoff to Barn Bluff which goes off in a south westerly direction. And then the steep climb begins! Once you reach the top, you will have extensive views as seen in the photo at the bottom of this page. Good place to have lunch and take it all in. As mentioned, I did this side trip on Day 2, leaving the heavy pack at the Huts, and just taking my daypack to the summit. After the climb and the return to camp it was on to Windermere Hut, a mere 7.0km away!